The Garritan libraries are proudly powered by the ARIA Player. No need to purchase a separate sampler. Use as a standalone to record and playback live – turn your computer into a virtual instrument! The standalone ARIA Player allows you to load and playback MIDI files. 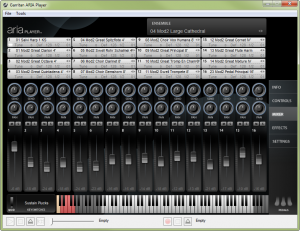 Use as a plug-in (Audio Unit, VST, RTAS) with sequencers or notation programs such as Finale. Features Conexant’s Endless Wave technology for hard disc streaming of multiple stops and ranks. Fine tune your performance or playback with integrated controls. Independently controllable Close and Ambient microphone levels in addition to Master Volume. Independent EQ s for Close and Ambient microphone pairs. 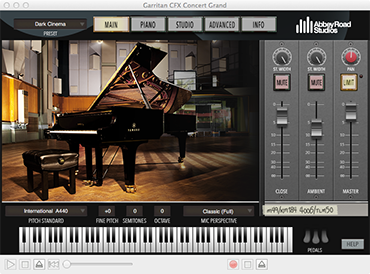 Five new Convolution Reverb presets for the CFX Concert Grand: “Dark Pad”, “Deep Space”, “Jazz Club” and “Retro Space” and “Vintage Algo”. Comprehensive control over physical aspects of the piano: Lid setting, Sympathetic Resonance, Sustain Resonance, Release Volume, Release Crossfade, Release Decay and Pedal Noise. Fully adjustable stereo width controls. Selectable Stereo Image to hear the instrument form the perspective of a performer or listener. Scala file support also allows you to play in the various temperaments of earlier historic eras. Swell, blower noise, tremulant, chiff noise, and equalizer are all available. Crescendo pedal instruments emulate pedal functions commonly found on medium and larger sized pipe organs. Control the placement of microphones with Stereo Stage. With Convolution Sampled Reverb, place your pipe organ in a cathedral, a small chapel, a variety of concert halls, or other acoustic spaces for spectacular results. Note-to-note variation in intonation and timbre for more natural, human sounding playback. Adjust the overall timbre and note lengths for individual instruments. Integrates the high quality Ambience Reverb with the ARIA Player and has individual mixing sends for each instrument. With Convolution Sampled Reverb, place your band in a cathedral, a small chapel, a variety of concert halls, or other acoustic spaces for spectacular results. Convolution Sampled Reverb may require the most recent ARIA Player update. Pedal mode emulates the foot pedals on an orchestral harp to achieve natural sounding glissandi. Adjust the amount of finger pluck sound as well as the overall brightness or aggressiveness. With Convolution Sampled Reverb, place your harp in a cathedral, a small chapel, a variety of concert halls, a film score space or other acoustic spaces for spectacular results. Fine tune specific instrument performance with attack, decay, sustain, vibrato, saturation and brightness controls. Blend controls and the Mod Wheel allow cross-fading on special Blending Textures samples. With Convolution Sampled Reverb, place your music in a cathedral, a small chapel, a variety of concert halls, or other acoustic spaces for spectacular results. Valve, breath and air noise for a more realistic performance. Adjust the overall timbre, length, tone quality and tone warmth for individual instruments. With Convolution Sampled Reverb, place your instrument in a cathedral, a small chapel, a variety of concert halls, or other acoustic spaces for spectacular results. Mod Wheel controls volume and timbre changes for expressive playing. With Convolution Sampled Reverb, place your instrument in a cathedral, a film score space, a variety of concert halls, or other acoustic spaces for spectacular results.